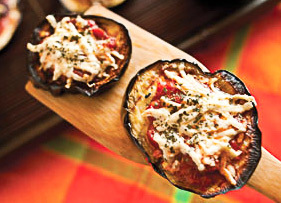 Vegetable pizzas with eggplant as a base is what’s pictured. Zucchini rounds from “8-ball” variety are also an excellent choice. The “8-ball” variety may be hard to find outside of your local produce stand which is why eggplant makes a wonderful substitute. If you really want to try this zucchini and can’t get “8-ball”, you can cut them into slices lengthwise and make little boats to carry your Metabolic friendly pizza toppings. Oil the grates of your grill using a wad of paper towels dipped in vegetable oil and tongs. Pre-heat the grill to medium high heat. Brush the cut eggplant with olive oil and grill it 7-8 minutes. Remove them from the grill, flip them over (grill side is facing up) and top the grilled side with 1 tablespoon of sauce, 1 tablespoon of cheese and various toppings. Put these back on the grill and cook, with the lid closed for an additional 7-8 minutes, until heated through. Serve and enjoy! This entry was posted in Healthy Ideas, Metabolic Medical Center Recipes, Modified Profast (Fast and Flexible) Recipes, Nutriplus Recipes (Balance Your Pyramid), Party & Entertaining, Vegetables and tagged eggplant, grilled vegetables, low-sodium pizza sauce, low-sugar pizza sauce, metabolic diet recipes, pizza, turkey bacon, zucchini by foodies4mmc. Bookmark the permalink.